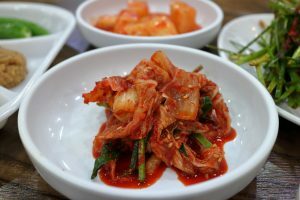 Kimchi also called the ‘Korean Superfood’ and is a must have side dish for all Koreans. 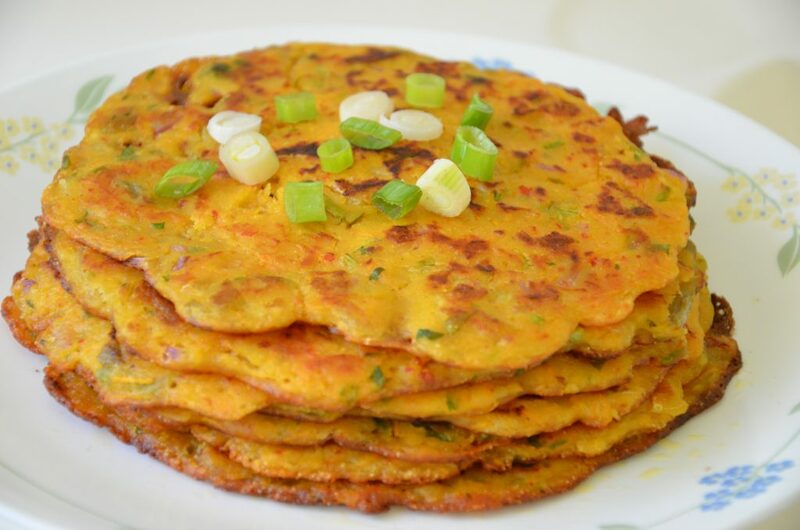 It is made from fermented vegetables (most often cabbage) and has a unique salty and spicy flavour. It is rich in probiotic strains (including Lactobacillus plantarum and Lactobacillus brevis) and hence scientists give it equal status to yogurt when it comes to probiotic foods. 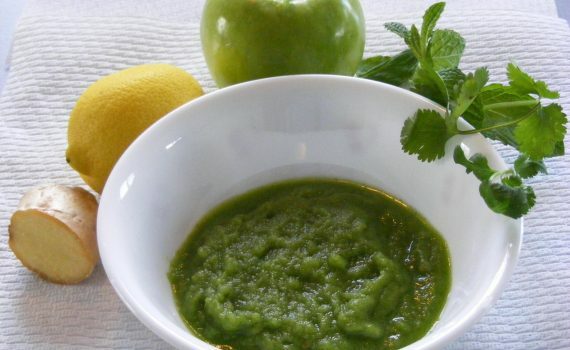 It is also packed with antioxidants and contains vitamins A, B, C and K. It is also loaded with vital minerals like potassium, calcium and magnesium. I bought Kimchi in bulk from Costco, and since I have a lot-have been experimenting with some Korean dishes that incorporate kimchi. 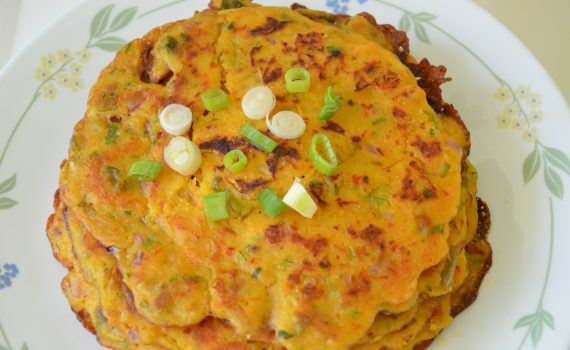 Try out this Indo-Korean style ‘Kimchi Uttapam‘ which is my twist on the traditional Korean Kimchi Pancakes. 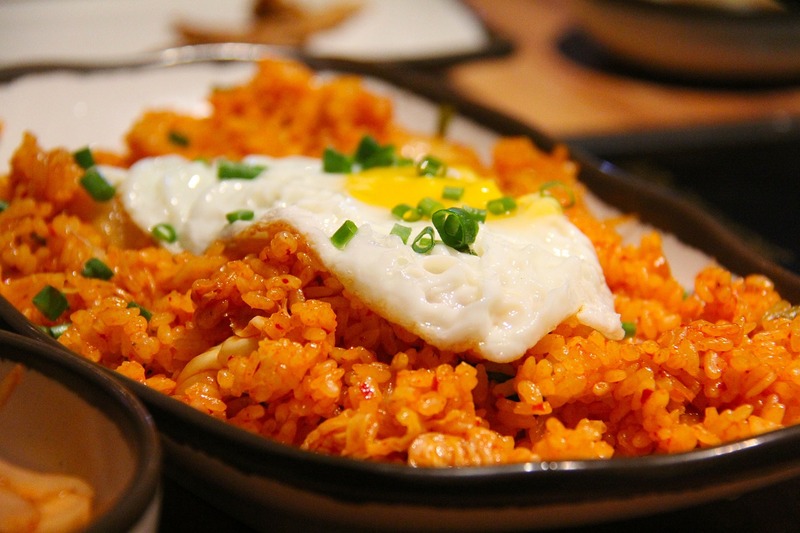 Kimchi Fried rice is a quick and easy dish made mostle with leftover rice. You could add any meat/chicken/seafood/ mushroom to it if you wish. On medium high heat preheat a pan/wok and once heated and add the garlic, stir it fast for about 10 seconds. (if you want to add any meat/chicken/seafood-add it now and stir-fry till it is cooked). Add the Kimchi and stir-fry till almost cooked. Add the rice and the kimchi juice. Mix together till all the rice gets coated with the kimchi juice.Add the sesame oil and mix them well. Remove from the heat. Serve hot garnished with the egg and spring onions. Oats are a rich source of both soluble and insoluble fibre and this makes it a great food for those trying to lower cholesterol. Besides fibre, oats is also loaded with magnesium, phosphorus, thiamine and zinc. So with such an impressive resume-why is it one of least popular grains especially among Indians? Blame it on the mushy, gooey texture when cooked with liquids. Also, oats porridge by itself is so bland that you end up adding lots of sugar to make it palatable, thus making an otherwise healthy dish into a totally non-healthy dish. So, what is the solution? How can we use the oh-so-good oats and make a dish that is tasty, palatable and not mushy or gooey? 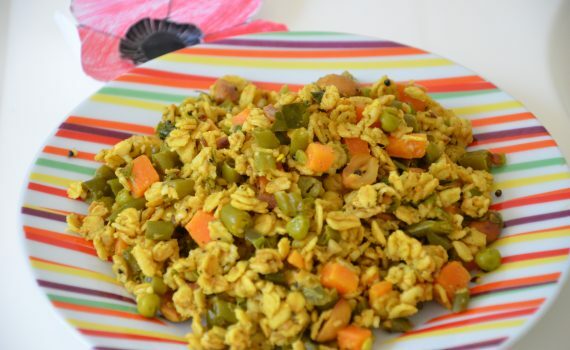 Here’s the answer: Oats upma Or Oats Pulav (the difference is in what you use for seasoning). For upma add a tadka of mustard seeds, jeera, channa dal, curry leaves while for the pulav add whole spices like cardamom, peppercorns, shahi jeera, cinnamon sticks and ginger+garlic paste. Dry roast oats for a few minutes, until it becomes slightly hot to touch. Heat oil in a pan, add mustard seeds, when it splutters, add the rest of the ingredients for tempering and the turmeric. Then add finely chopped onions, peanuts, green chili, ginger and saute until onions turn translucent. Add all the vegetables,salt and saute for a few more minutes, then add 3/4 cup of water and salt required. When the water starts boiling, lower the flame add the roasted oats, cover and cook till done. Switch off and garnish with coriander. Serve hot with a dash of lime. You can also serve chutney with it. 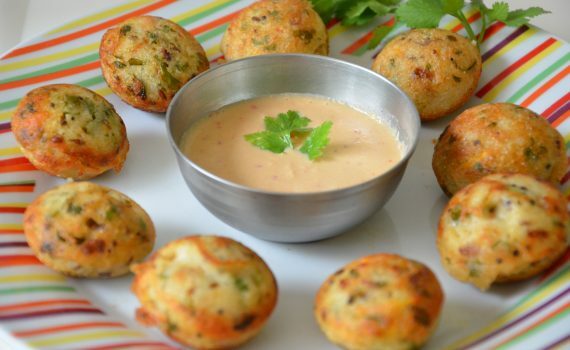 This is an easy recipe and can be made for the lunch box or even for a party. Heat the oil in a pressure cooker, add the whole spices (cumin, cloves, cinnamon, bay leaves, cardamom, peppercorn). When the jeera seeds start to sizzle, add the chopped garlic and saute on a low flame till it starts to brown. Add turmeric and the onions, salt and saute till the onions start turning pinkish brown. Add the tomatoes and cook till they are completely mashed and oil starts to leave the sides. Add the red chili powder, coriander powder, garam masala and mix well. Then add the mixed vegetables and mix till the masala coats the vegetables. Strain the rice and add it and mix for 1-2 minutes. Add the water, mix and taste the water for salt and flavours. Once the pressure drops open the cooker and garnish with coriander leaves(cilantro) and mint leaves. 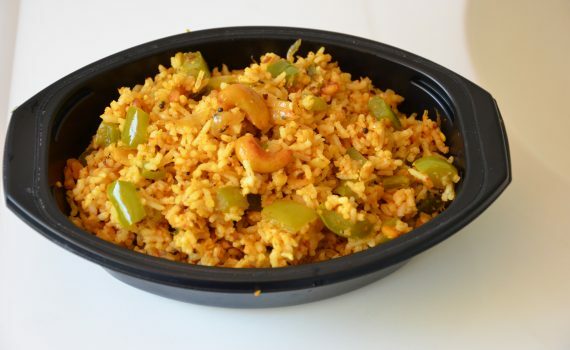 Slowly fluff the pulav a little. 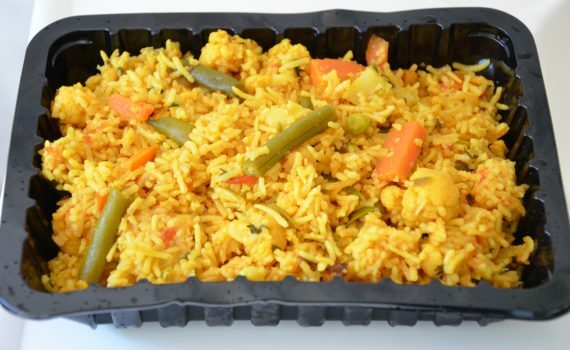 Serve the mixed vegetable pulav with raita. Capsicum or bell peppers are rich in vitamins A, C, K, niacin and folate along with copper and magnesium. The red bell peppers have more vitamin A and C when compared to the green peppers. Dry roast (no oil) mustard seeds,cumin seeds,urad dal, channa dal, coriander seeds, curry leaves, dry red chillies on medium heat till the rawness disappears and the flavors come out. Switch off and let it cool. Once cool, add the roasted peanuts and grind to a make a fine powder. Heat oil in a vessel and add the sliced onions and saute till golden brown. Then add the sliced capsicums and cashew nuts(or peanuts) and fry them till the capsicum are still crunchy in texture. Add salt to taste and mix. Reduce heat and add the the ground masala powder, garam masala and mix well. Then add the cooked rice and combine. Garnish with the chopped coriander. Broccoli belongs to the same cruciferous family like cabbage,kale, cauliflower,collards and Brussels sprouts. It is a low calorie vegetable and is loaded with fibre, vitamins A, C folic acid and is also known for it’s anti-inflammatory properties. It must be noted that eating raw broccoli has actually more benefits than eating these in the cooked form as some of the antioxidants and vitamin C are destroyed by heat. Add a little salt and steam the broccoli florets for 2-3 minutes (the broccoli should be crunchy and not soggy). Keep aside (alternatively, you could add the broccoli florets to boiling salt water and cover and keep for 4-5 minutes. Then drain and keep aside). 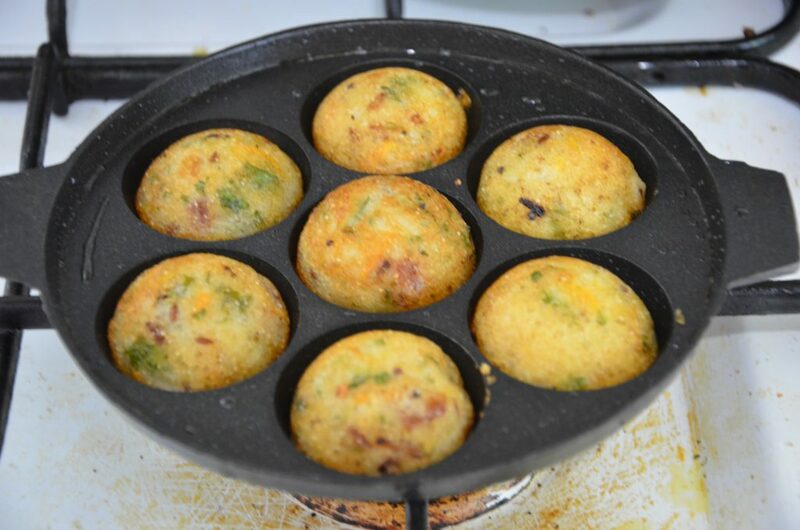 Heat the oil in a kadai, add the minced garlic and green chilies(optional)fry for a minute. Reduce the flame to medium heat and add the spice powders (turneric, coriander, jeera, garam masala) and quickly mix in the oil (otherwise the spices will burn). 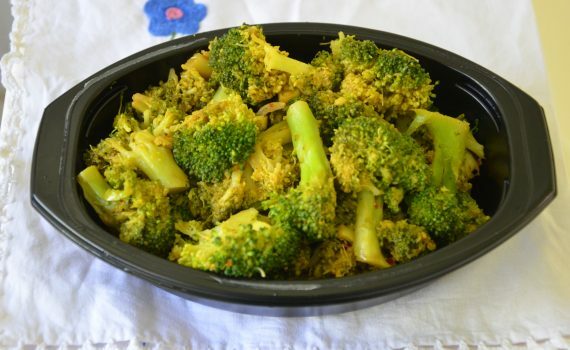 Quickly add the steamed broccoli and mix well such that the spices coat the broccoli. Check for salt(add more if necessary). Stir-fry for a couple of minutes. 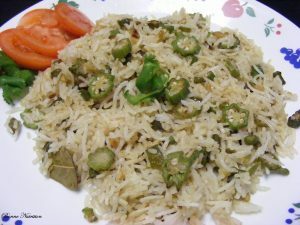 Serve as a side with rice and dal. 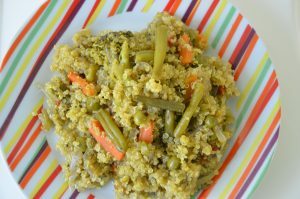 “Quinoa” (pronounced keen-wah) is a high protein ‘pseudo cereal’ (foods that are cooked and eaten like grains and have a similar nutrient profile). 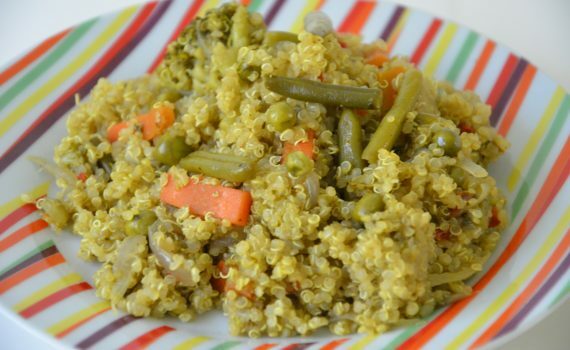 Quinoa is actually a seed and is rich in complete protein, fibre, the B vitamins and healthy monounsaturated fats. It is believed that substituting quinoa for grains like polished rice and wheat could improve the blood glucose levels in diabetics and the cholesterol levels . Also, since it has a high fibre content it is a good choice for those looking to lose weight (portion sizes still matter). 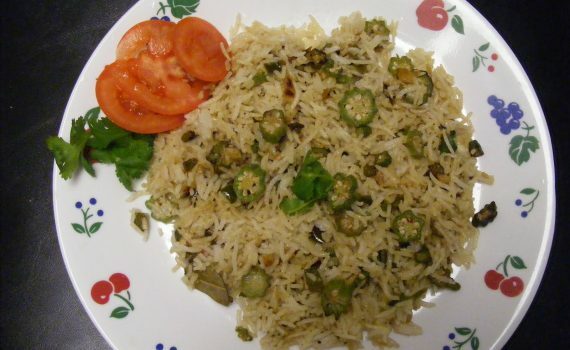 This pulav has a nice flavour since I used green masala( paste of coriander leaves, mint leaves, ginger and green chilies) and lots of vegetables. Heat the oil in a kadai, add the whole spices (jeera, cardamom, peppercorns,bay leaf, cloves, cinnamon), then add the turmeric, sliced onions, green chili and saute till the onions start turning golden brown. Then add the mixed vegetables, ginger+garlic paste and saute till the vegetables are half cooked. Add the tomatoes, 2-3 tbsp of the green masala, salt and cook till the tomatoes are all mashed up. Add the washed and soaked quinoa and stir-fry for 2 minutes. Add 3 cups of water (or chicken stock) , taste for salt and cover and cook till it boils. Then turn down the flame and let it simmer till the quinoa is cooked and fluffy (sprinkle some water on top if needed). Stir occasionally and switch off when the quinoa is cooked.